"I am a person of passion, positive impact, and perseverance for the education profession." My philosophy of teaching is based upon an authentic interest in biology, a deep care for the success of my students, and the belief that my students can rise to or exceed my high expectations. I know that all students are capable of high standards of learning. I have a vision for student success that students might not yet have for themselves. I pride myself on presenting a highly organized, well-managed classroom. Rather than managing compliance and behavior, I treat students with dignity that allows them to view my classroom as an opportunity for creating community and new experiences. I promote a positive atmosphere in my classroom. I have observed that when students are enjoying themselves, their mental states are receptive for learning. When I am obviously enjoying the content or structure of a lesson, students will mirror my interest and enthusiasm. All it takes is brief interludes of humor, movement, song or story. I am unabashedly enthusiastic about my interest in biology. 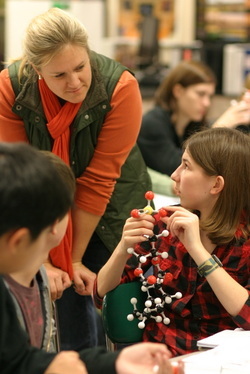 My greatest reward is seeing students acquire a deep understanding of biology and I know that this will only happen if I capture their imagination and stimulate their curiosity. I am conscious of setting a personal example with my own demeanor in the classroom and beyond. Mine is an important role as a positive, supportive adult in an adolescent’s life. I recognize and value individual differences in students, adapting to each individual students’ abilities, processing rate, interests, culture, and social circumstances. I make effort to see the world from a students’ perspective in general, and to the extent possible, consider individual students circumstances. I work to help students do their best given their individual situations. I use a variety of instructional strategies to meet the needs of all students. Students with varying skills and knowledge are given equal opportunity to highlight their creative strengths, show mastery of the content material and to find an appropriate challenge to do more than the minimum requirement. Teaching is a very complicated profession. It demands broad knowledge of subject matter, curriculum and standards. It demands enthusiasm, a caring attitude and a love of learning. It demands knowledge of classroom management techniques. It demands a desire to make a difference in the lives of young people. I am proud to have made teaching my life’s work and even more gratified by the successes of my students.